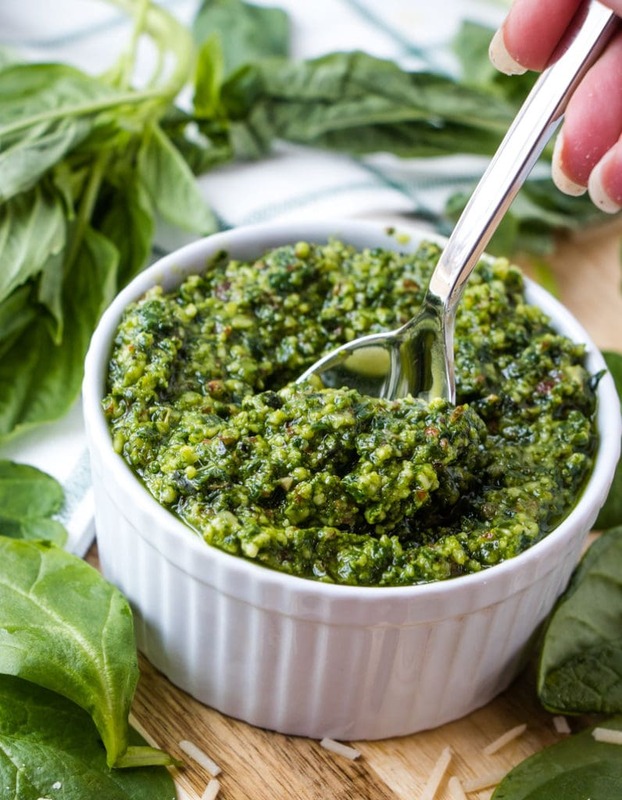 Store-bought pesto just can’t compare! 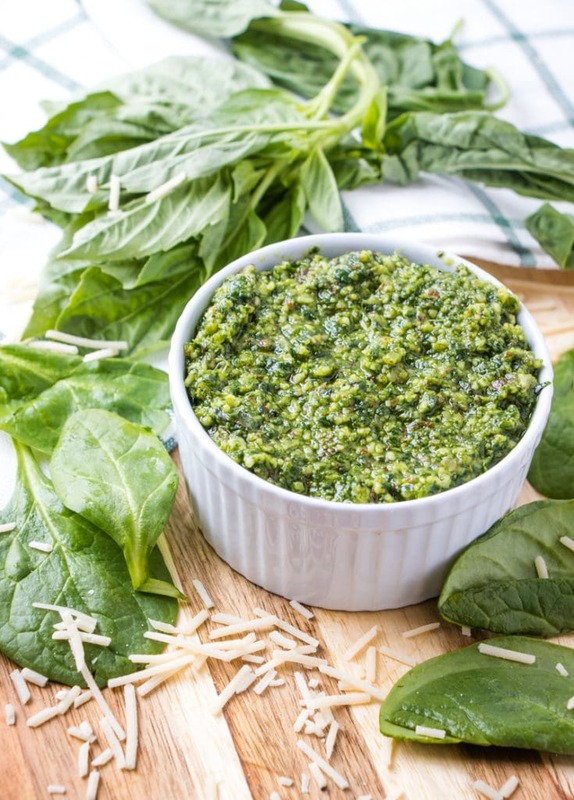 This Homemade Pesto with Spinach gets a nutritional upgrade with extra greens! One reason I adore pesto: F-L-A-V-O-R. A small amount of pesto adds a huge punch of flavor to whatever it is you are making. And you can use pesto in so many ways. Of course, you can always add it to pasta. Pesto pasta is such a quick and flavorful dinner. But don’t stop there. Pesto and eggs is fabulous. Pesto on sandwiches is amazing. And don’t even get me started on pesto on pizza. Make up a batch and you have instant flavor for your food all week. 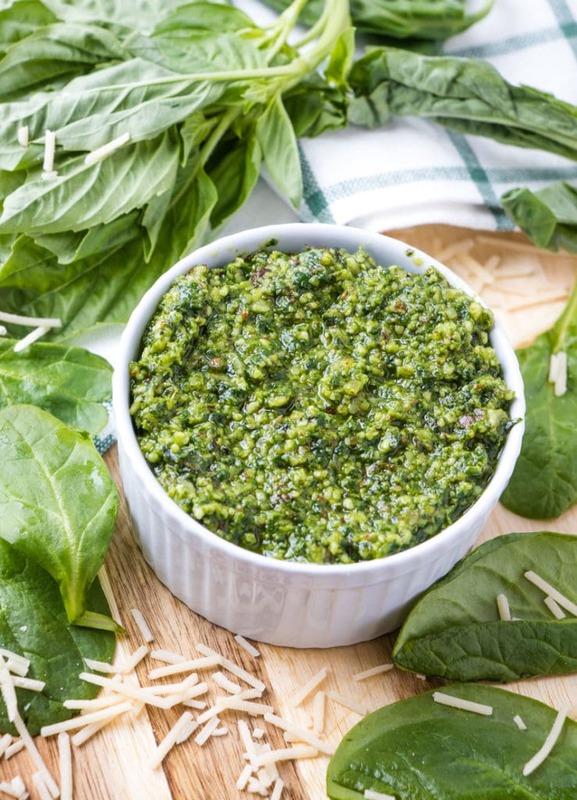 Traditional pesto is made with fresh basil, pine nuts, olive oil, parmesan cheese, garlic, and salt. The great thing is, you can take the basic idea of pesto and play with it, creating slightly different flavor profiles. You can switch out the basil for a different herb. You can substitute the pine nuts for a different nut. Or switch out both like I did with this cilantro pesto. I also used almonds instead of pine nuts. Pine nuts are so expensive and I rarely keep them on hand, even though I love them. Almonds work beautifully in pesto, so don’t worry about not using pine nuts. Are you ready to get started? Let’s make some pesto! Another tasty homemade pesto recipe is this Sun-Dried Tomato Pesto recipe! This post was originally published in 2014. Photos were updated and a video added in 2019. I make this same pesto, but with walnuts. 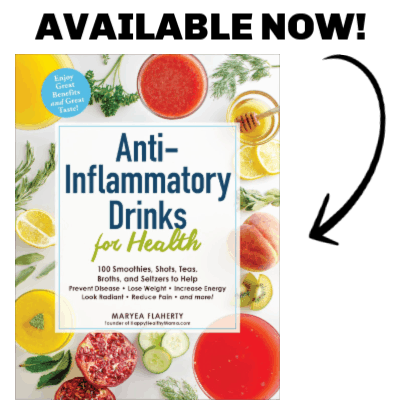 I love it and put it on pizza, pasta, and quinoa! Oh this looks so great!! Awesome way to add in extra spinach. I love making big batches of pesto and popping it in the freezer. Why haven’t I tried freezing it? That’s a great idea! Do you have any recipes for pesto without cheese? Just wondering about a dairy-free option. You can sub nutritional yeast for the parmesan cheese. I have done it and it’s not exactly the same, but a close comparison! Ok I’ll have to try that! Thanks! Ohhh on top of burritos–great idea! I absolutely LOVE this recipe. Can’t wait to make it! This seems like a silly question, but can you taste the spinach? I’m a picky eater and I dont like spinach but I try to mix it into things I do like that will disguise the flavor so I still eat healthy.